“The Invisible”, a supernatural thriller about a writer with bright future until brutally attacked and left to die. He find himself trapped between the worlds of living and dead, his only chance for survival is to unravel the mystery of what happened to him and why, before it`s too late…I bet you wonder what the hell this has to do with anything? Well, there begins the story of the “Traumatic Scenes”. Brazilian Power Metal quartet SUPREMA managed to exploit the idea behind this movie into mixture of poetry, great vocal performance and even better music. Don`t be fooled, it`s not the movie in verses (this isn`t “Les Miserable’s” for crying out loud), but the tale about various stages of human mind and parapsychology. Themes covered are fury, anger, visions, nightmares… I`m not going to reveal all, some things you should discover by yourself. Album introduction – “Marks of Time” brings the distant echo of music with the spoken verses, narrated by Tarsis Marim. “Dark Journey” is the real album opener, explaining how does waking up on the “other side” feels like. Fast music, and keyboard effects in unexpected parts, amazingly combine and hint that something unnatural is happening. Music remains fast, but the keyboards change into choirs, amazing melodies and pretty solid guitar solo somewhere halfway through “Rising From the Ashes”. Is there a better way to describe the “Rage and Fury” other than heavy riffs? Didn`t think you`d disagree. “Visions From the Other Side” besides keyboards and heavy riffs introduce acoustic guitars and some guttural vocals belonging to Victor Prospero (try to remember his voice cause he`ll be back growling on two other tracks “Burning my Soul” and “Traumatic Scenes”) making this track pretty interesting. “Burning my Soul” is the sound of unfilled dreams and anger in full force. The storm of rage is over, leaving reminiscence of the time before. “Memories”, nostalgic ballad, makes great contrast to the previous track. Everything comes with a price, dearie - and that`s what the progressive “Nightmare” and psychedelic “Before the End” are all about. “Iced Heart” is yet another progressive and heavy track, with amazing guitar riffs. Last track, the carrier of the album title “Traumatic Scenes” tells the whole story in short, highlighting the tragedy of previous events, and the traumatic outcome that these events have caused. Overall SUPREMA brings you one great story in amazing package. 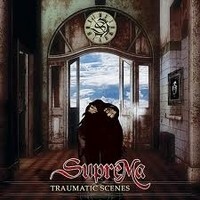 If you liked “Mercy Falls” by SEVENTH WONDER, you`ll like “Traumatic Scenes”, too. These guys from São Paulo did an amazing job on their debut album, and it would be a shame for it to remain undiscovered by many.